What Day Of The Week Is July 8? 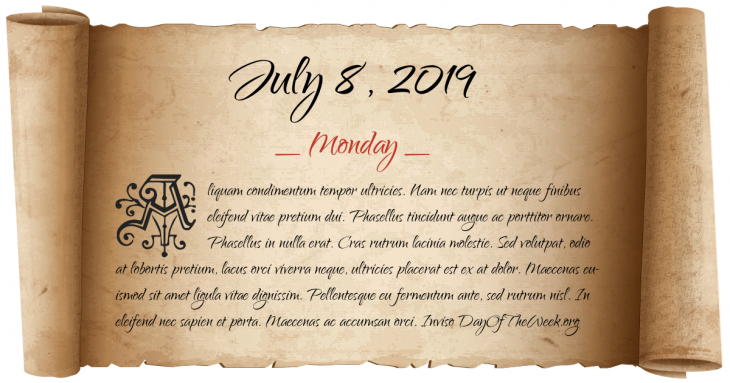 July 8, 2019 is the 189th day of the year 2019 in the Gregorian calendar. There are 176 days remaining until the end of the year. The day of the week is Monday. Here’s the July calendar. You can also browse the full year monthly calendar. War of the Sicilian Vespers: the naval Battle of Malta between the Aragonese and the Neapolitan fleets is fought. Charles II of England grants John Clarke a Royal Charter to Rhode Island. Great Northern War: Battle of Poltava – Peter I of Russia defeats Charles XII of Sweden at Poltava thus effectively ending Sweden’s role as a major power in Europe. French and Indian War: Battle of Restigouche – British forces defeat French forces in last naval battle in New France. The Olive Branch Petition is signed by the Continental Congress of the Thirteen Colonies. Joseph Bonaparte approves the Bayonne Statute, a royal charter intended as the basis for his rule as king of Spain. St. John’s, Newfoundland is devastated in the Great Fire of 1892. Turkey, Iran, Iraq and Afghanistan sign the Treaty of Saadabad. Richard Nixon delivers a special congressional message enunciating Native American Self-Determination as official US Indian policy, leading to the Indian Self-Determination Act. Assassination attempt against Iraqi president Saddam Hussein in Dujail. Who were born on July 8?